Aside from the exciting trails that line Isle au Haut's southern coast, there are also several miles of trails that travel the interior of the island within the Acadia National Park boundaries. 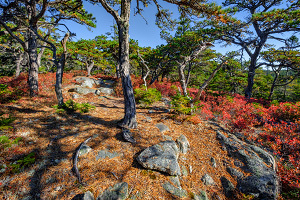 The Median Ridge Trail starts at Barred Harbor and heads north following the higher ridgelines at the center of the island. 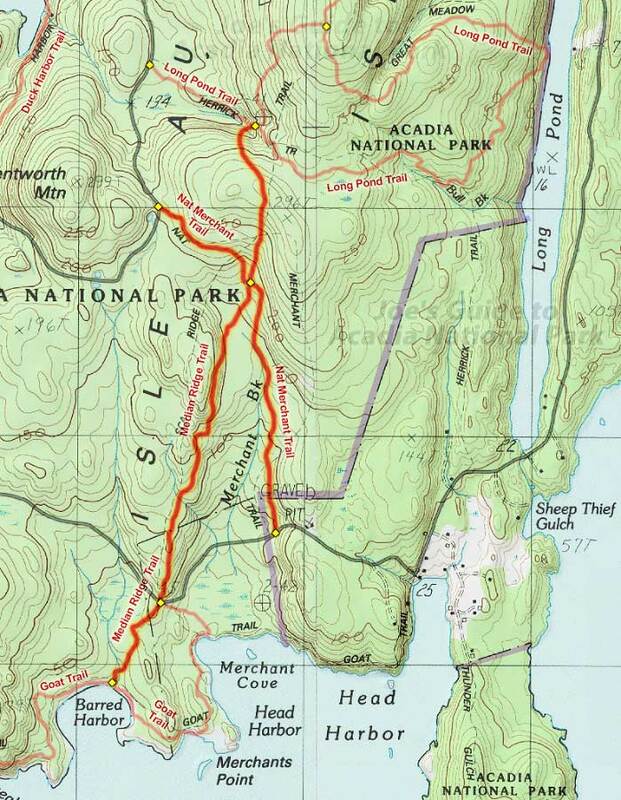 The Nat Merchant Trail cuts across the island diagonally, connecting the Duck Harbor Road with the NPS border near Eastern Head. While neither trail should be considered a destination hike, they are still pleasant walks in the woods that serve as alternatives to walking the dirt roads. The Median Ridge Trail officially starts at the junction with the Goat Trail at Barred Harbor, but you can also pick it up by hiking the road east for about a mile from Duck Harbor. Hiking north from the road, the trail heads up the center ridge line of the island through some lovely scenery of exposed rock sprinkled with smaller pine trees; a few spots around here make excellent spots for a lunch break. Note that the trail skirts the east side of the ridgeline and doesn't actually reach the crest of the ridgeline. Before reaching the junction with the Nat Merchant Trail, the Median Ridge Trail descends into a thicker section of forest; after heavy rains this section can get swamped in several sections. The trail continues north through the rolling forested hills until it officially ends at the junction with the Long Pond Trail. From here, you can do the Long Pond lollipop loop hike or walk west out to the road. Note: Some trail signs mention to the "Ridge Trail", but for all intents and purposes, they are referring to the Median Ridge Trail. The current trail loosely follows the old historic "Ridge Trail", but that abandoned trail followed the crest of the ridge and continued further north on the island. The Nat Merchant Trail was named after a fisherman who lived on Isle au Haut and it crosses over the Median Ridge Trail, acting as a shortcut hike for those heading from town or the ranger station to the southeast corner of the island. 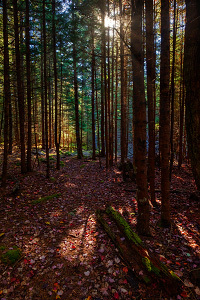 This trail is fairly nondescript, but it is a pleasant walk in the woods, especially one stretch through a dark section of hemlocks. The southern terminus of the trail is near the NPS boundary at the dirt road that continues east to Eastern Head. Both of these hikes are pleasant strolls in the woods and are enjoyable ways of getting away from it all, but these are not destination hikes. If this is your first time on Isle au Haut and your time is limited, skip these interior trails in favor of the stunning trails that line the southern coastline around Western Head.